Looking for a fun way to help your math students practice solving equations with variables on both sides? In this activity, students solve 15 equations to create 5 different codes. 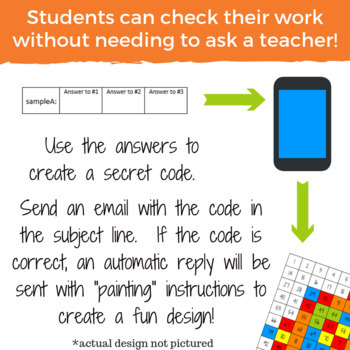 They email the codes and will receive "painting" instructions if their codes are correct! It's an easy way for students to check their answers without asking a teacher! The students will use the directions from the automatic replies to create a colorful design on the back side of the worksheet. Test it out! Send an email to PaintByEmail@gmail.com and put testcode:123 in the subject line. You should receive an automatic reply! If it doesn't appear after a few seconds, you may need to check your spam folder or see if it's being blocked by your school. You will want to make sure your students can receive emails from parties outside of their domain before using this activity. 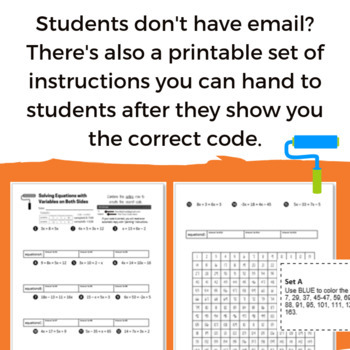 A printable set of "painting" instructions is also included if students do not have access to the emails. Solutions include positive and negative integers. Your students will need blue, green, red, yellow, and orange crayons, markers, or colored pencils to complete the work of art (I wouldn't recommend actual paint unless you're feeling extra brave!). © 2018 Kate's Math Lessons. All rights reserved. This purchase is for one teacher only. This resource is not to be shared without purchasing the proper number of licenses. Licenses are non-transferable. If you are interested in a site license, please contact me at katesmathlessons@gmail.com. 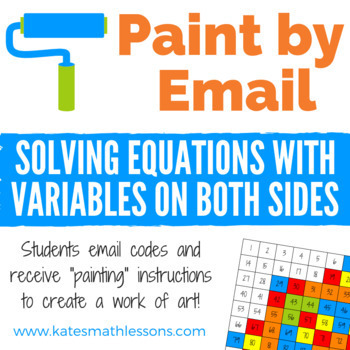 Are you signed up to hear about the latest updates and free resources from Kate's Math Lessons? Subscribe today and get a free set of my digital, self-checking Boom Cards!